I, ProlificProjectStarter, pledge to wear at least one Me Made item every day in May. Last year was my first MMM, I think I pledged to wear something me made 3 or 4 times a week and I actually managed to wear something every day. I now have more self sewn stuff in my wardrobe and wear a lot of it often, so lets see where the pledge leads me to this year. Second, I’m going away this weekend, so I decided to find out a sock pattern so that I have something to do while I’m traveling. This is my first attempt at socks, I bought some pretty bamboo needles especially as I didn’t have any small enough. Fingers crossed I don’t get Second Sock Syndrome. 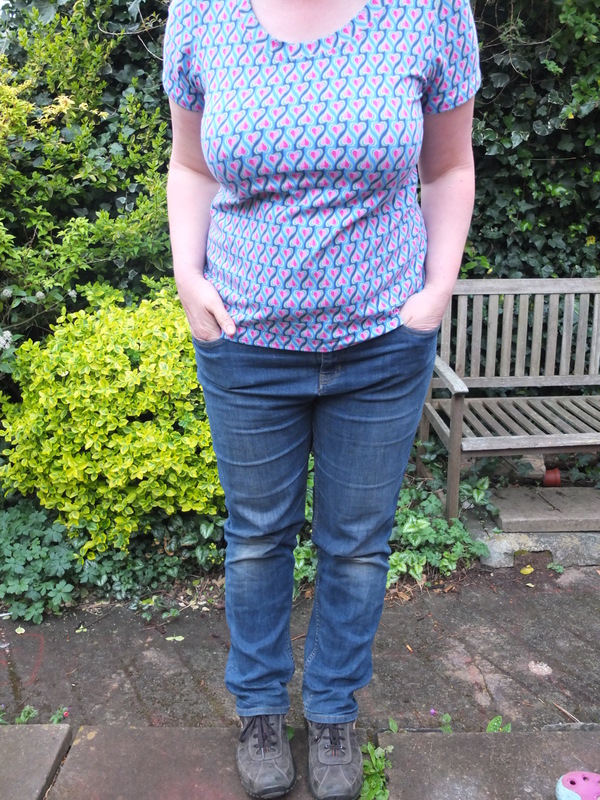 Lastly, I finally have some photo’s of my Ottobre jeans! So, the fit is definitely not perfect. But it is wearable as proven by the amount I’ve been wearing them. I was actually directed to “stand on that brick” by my photographer. Serves me right for nobbling him on his way to work I suppose. My mum declared them to be very well fitting and I didn’t even ask her. (This is an amazingly positive comment from a woman who is not known for mincing her words). And I may have shown off and told people I’d made them a couple of times. To general amazement. 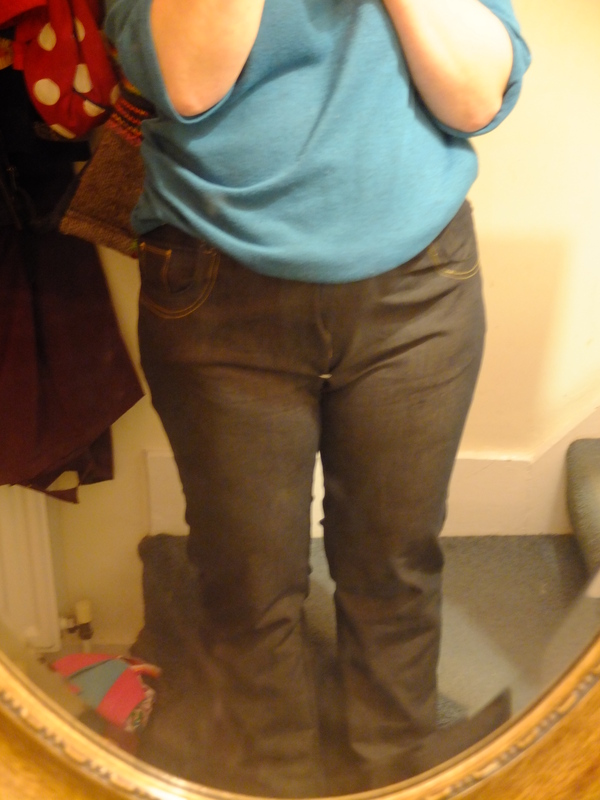 So, to make sure I don’t focus too much on my failure for perfection, here are my shop bought jeans. My only pair (and these were only bought after many demoralising tries to find something halfway decent). I think my homemade ones fit better. My muslin started with an inch seam allowance. Which meant after my first basted fit I could extend the crotch length a little, which has improved the fit, but I think I will add more crotch length next time. (Initially I just added length to the front pieces, as I did on my Junipers, but I went back and added it to the backs as well which improved some of the smiles at the back too). The other fitting adjustment I made was to pinch out some of the baginess at the centre back. I just altered the back centre seam so it curved in. I’m not sure that was the “right” thing to do but it has helped. So, now I’m off to make sure I have some Me Made Clothes packed for my weekend away so I can get my pledge off to a good start. 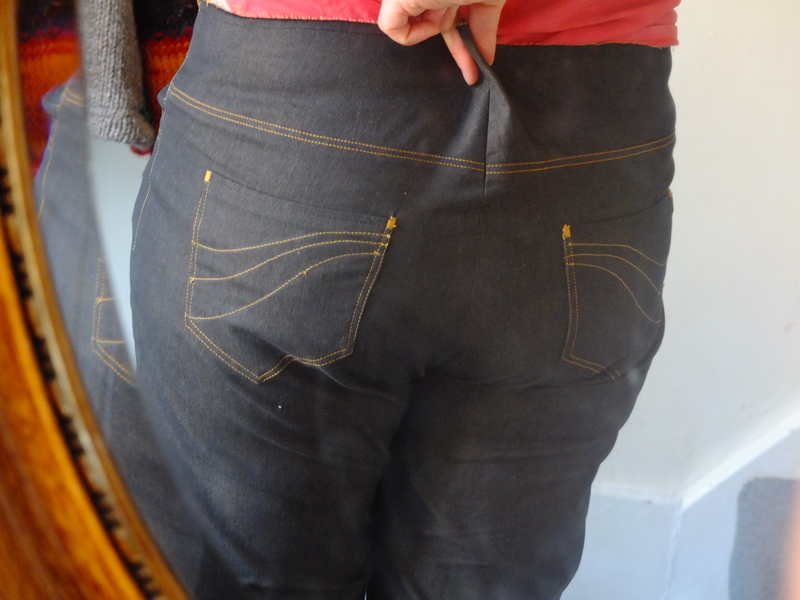 And who knows, maybe I’ll manage to get a second, slightly better fitting pair of jeans before the end of the month. (I can dream, right). I’m still sulking with the stripey fabric I have to make Jalie 3132. As it’s stripey, I did my usual trick of tracing the pattern piece and then flipping it to trace the other side so I can make sure the stripes are horizontal (a much better option than cutting on the fold). But I couldn’t get them straight 😦 The general consensus of all the helpful people on the facebook stashbusting sewalong page is to cut full pattern pieces, rather than half ones designed to be cut on the fold. So, this is the plan, when I can be bothered to retrace 3 pattern pieces at twice the size they are now (the sleeves are cut on the fold two, which is a new one on me). 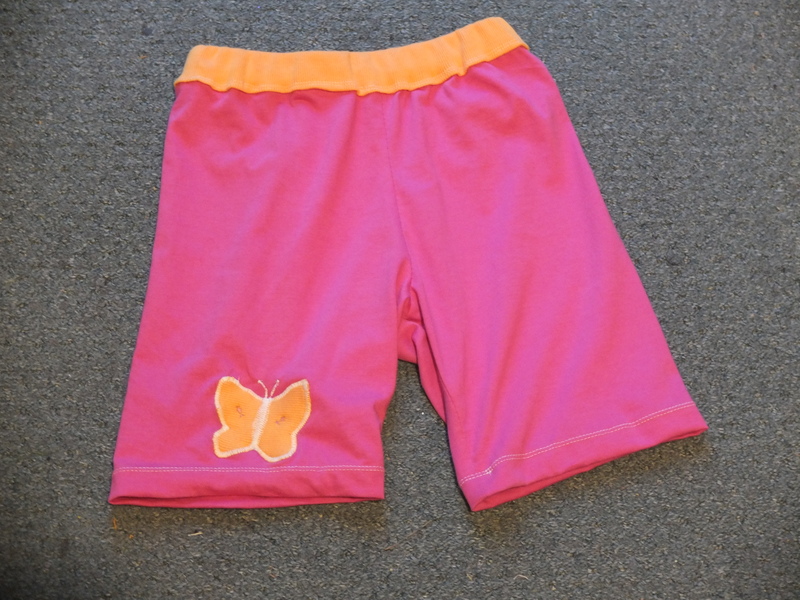 In the mean time I have made one and half pairs of modesty shorts for my daughter. 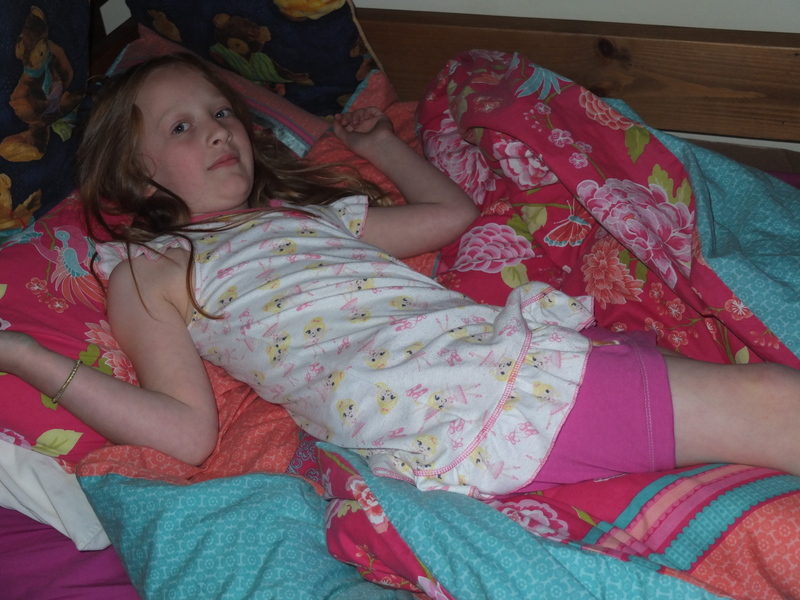 She got 2 nighties for her birthday, pretty with a few flounces, just up her street, but they are indecently short. This isn’t normally a problem, but so I don’t have to hide them when we have visitors staying, I decided to make some shorts. This was really quick, I used the Ottobre sweatpant pattern I already had traced out for her brother, folded it up to shorten it and left the pockets off. Job done. 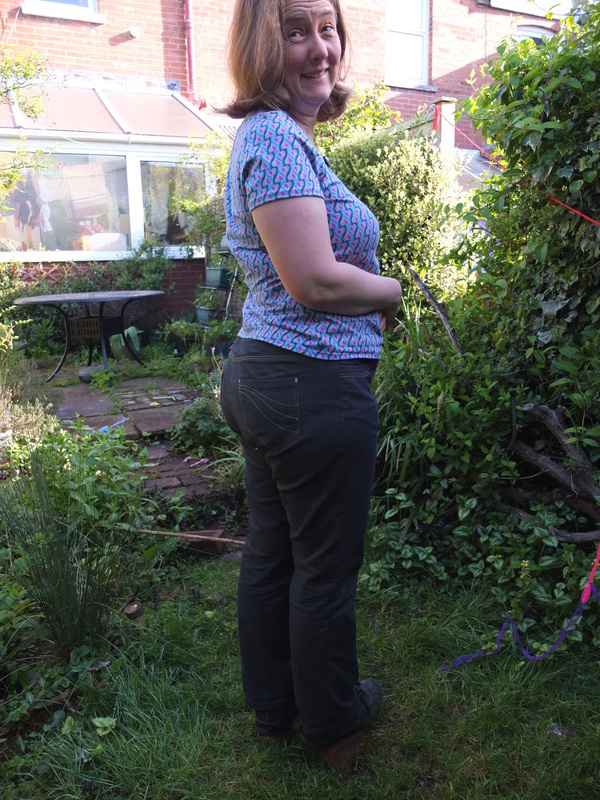 I cut the waistband the same width as the pattern piece but half the height as it’s designed to be made with pull cords. There was an annoying small bit of ribbing leftover, so I traced around a biscuit cutter to make an applique butterfly. I even remembered to iron interfacing on the back (big help). I thought it would sort of match the fairies on the nightie but it turns out they’re ballerina’s, whoops. Never mind, she still likes them and I’m half way through the next pair. (so, the photo’s are huge due to my ludditeness, but hey, they have a baby in, so I’m sure you’ll forgive me). If you’re wondering about the kimono top, it’s apparently on a teddy. This young lady is growing FAST. Anyways, they asked for matching hats. 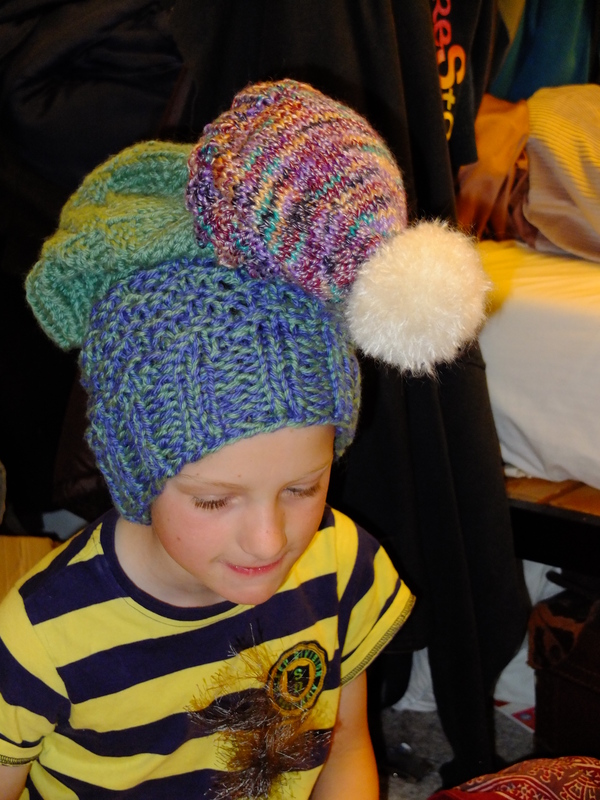 Matching knitted hats with huge bobbles (a.k.a. 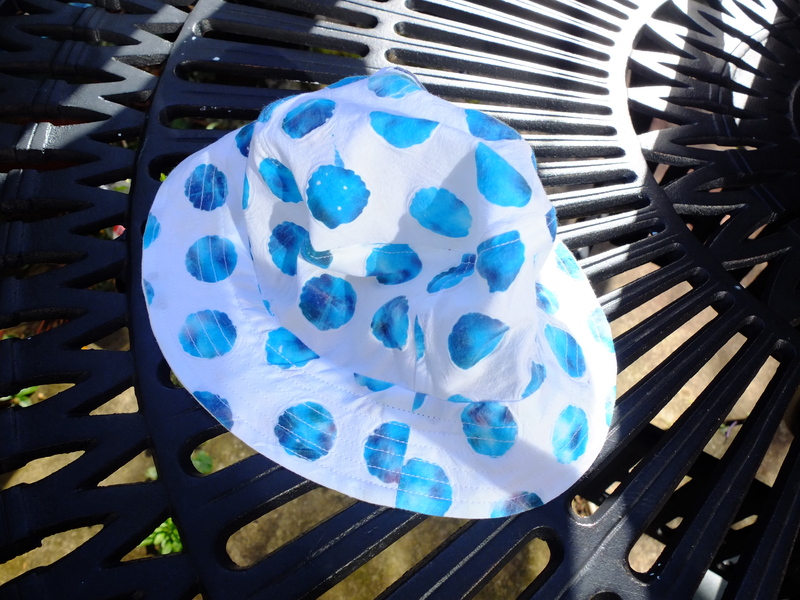 Hoxton Bonnets, as any Radmac listener will tell you). I struggled a bit with this request as a Brit, we all know Australia is land of eternal summer, cold lager, swimming pools, barbeque’s and dangerous animals. But apparently it gets frosty in the mornings in Perth in the winter. Plus they’re planning a trip to the northern hemisphere at Christmas. 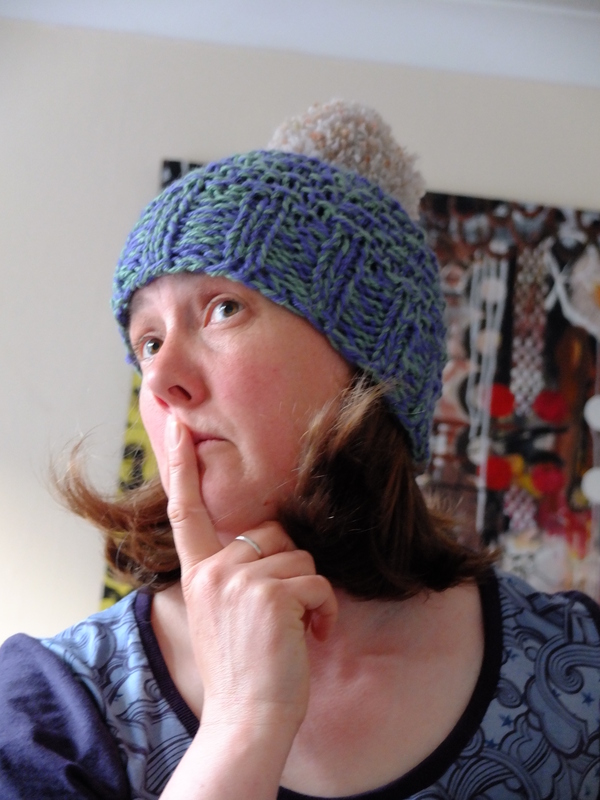 I still had this hat lying around at home and no-one in these parts is going to want it any time soon, so I rootled around in my spare yarn bag, dug out some needles, bought myself a new fangled pom pom maker and got going. 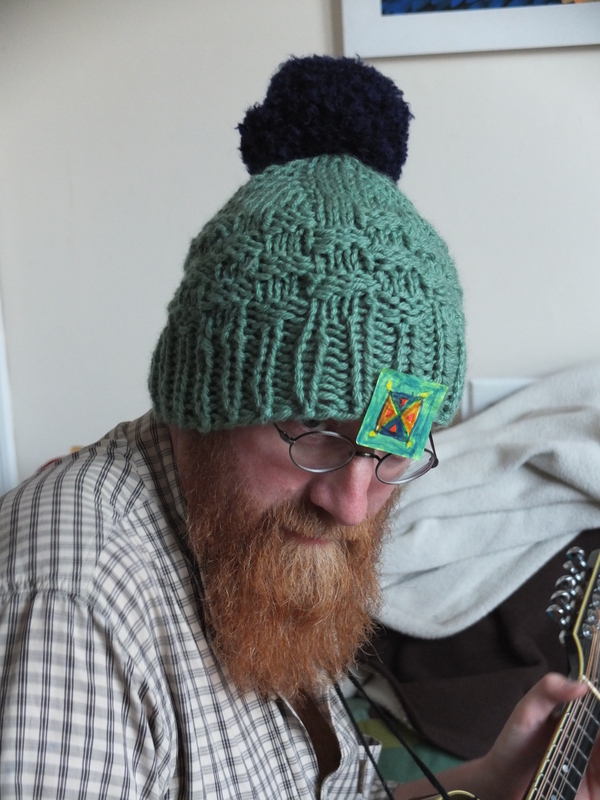 I managed a blue and green variagated hat, so it half matches the green one. 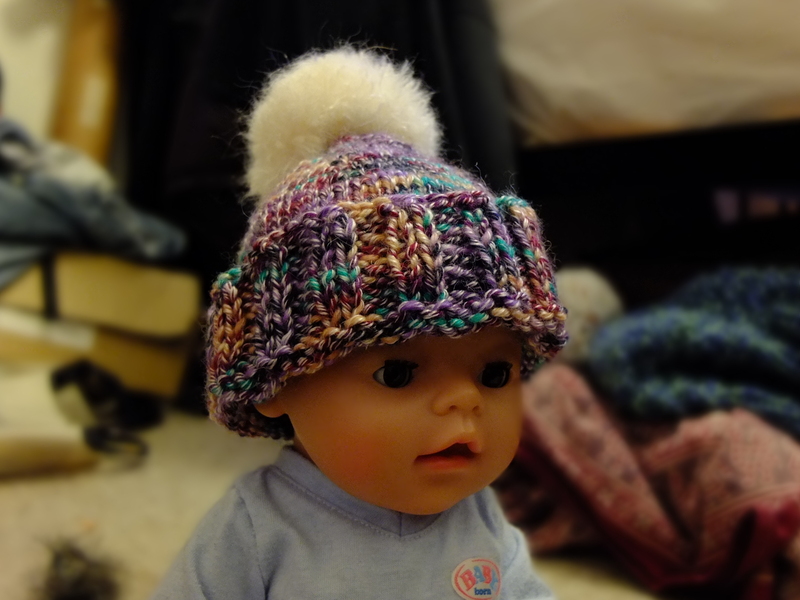 The stuff I used for the baby hat is lovely and soft. I had to guestimate the size as I’ve never done one that small before and I don’t know how big her head is. 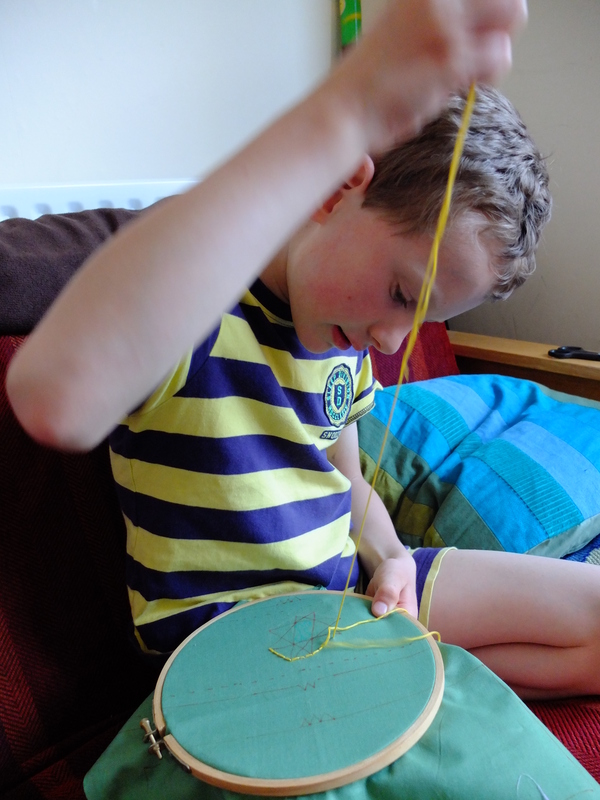 The pom pom makers were easy to use and much faster than the old-fashioned cardboard disc method. 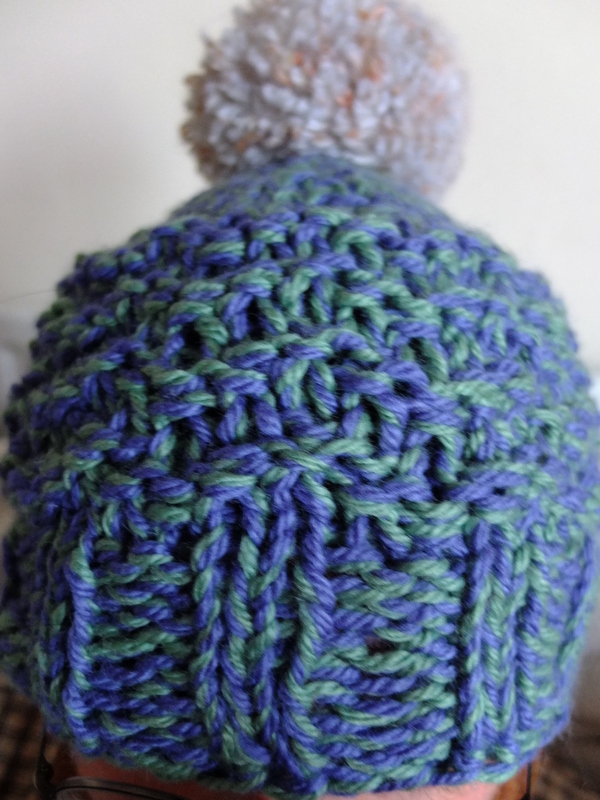 The baby hat is plain stockinette stitch, but the blue and green I did a sort of purl zig zag on the side. Which doesn’t show well, but it adds texture. Now, to post them up to my friend so she can include them in her next parcel to Down Under. 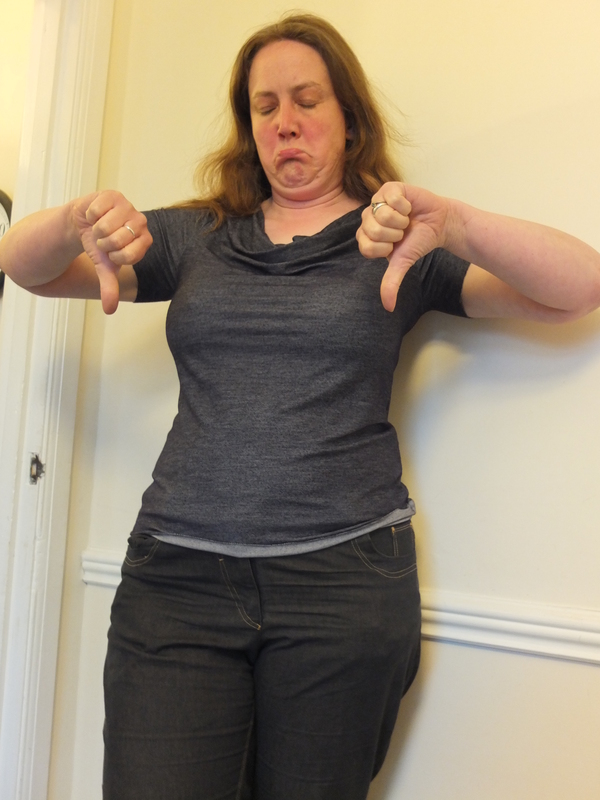 When is a sewing success not a success? 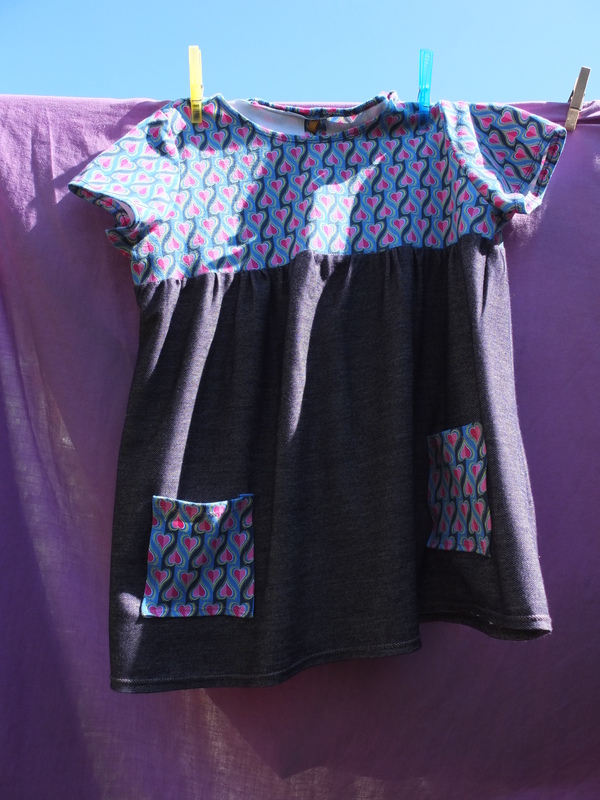 When you manage to piece together nearly all the scraps from your last two projects to make the lovely garment you envisaged, all your pattern hacking came out ok, nothing went wrong, no seam needed unpicking, it fits fine, a little growing room but doesn’t look too big just as you hoped and then your daughter declares it to be unwearable. Apparently it is too long to be a top and too short to be a dress. I think trying to get her to try it on with her denim shorts didn’t help. They were ok last summer, but that was a life time ago when you’re seven and the “I don’t wear trousers” has spread to “I don’t wear shorts”. Sigh. Needless to say, there are no modelled photo’s. This tunic top was my inspiration. She loves wearing it, with it’s big flarey gathers into a pretty yoke. 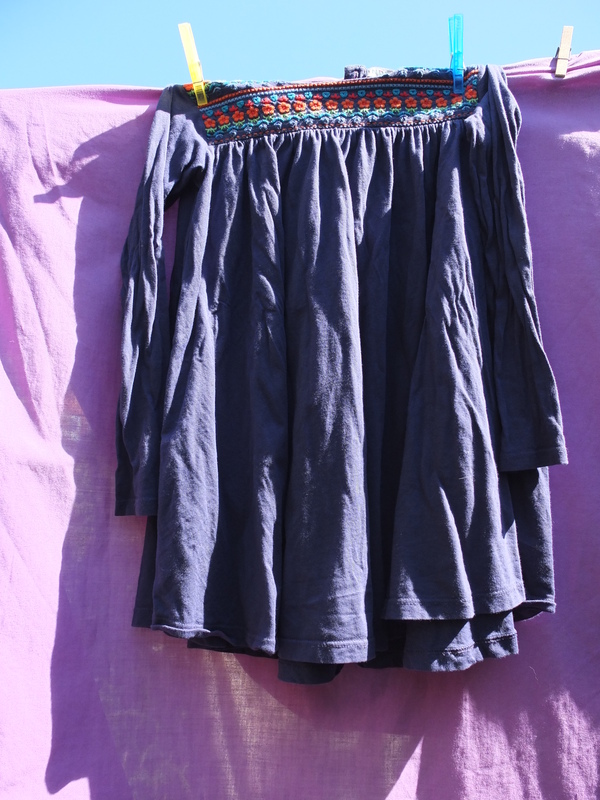 But in navy blue with long sleeves she isn’t going to be wearing it for much longer in all the sunshine we’ve been having. And she’s about to grow out of about half her short sleeved tops, there are only 3 that stand a chance of fitting her next summer. So the obvious thing to do seemed to be a short sleeved gathery fluttery top, a bit pretty, long enough to last at least next summer as well as this. I think it came out well. The heart fabric is good quality and quite thick, but the navy denim effect jersey is lightweight and quite flimsy and would be quite cool to wear I think. 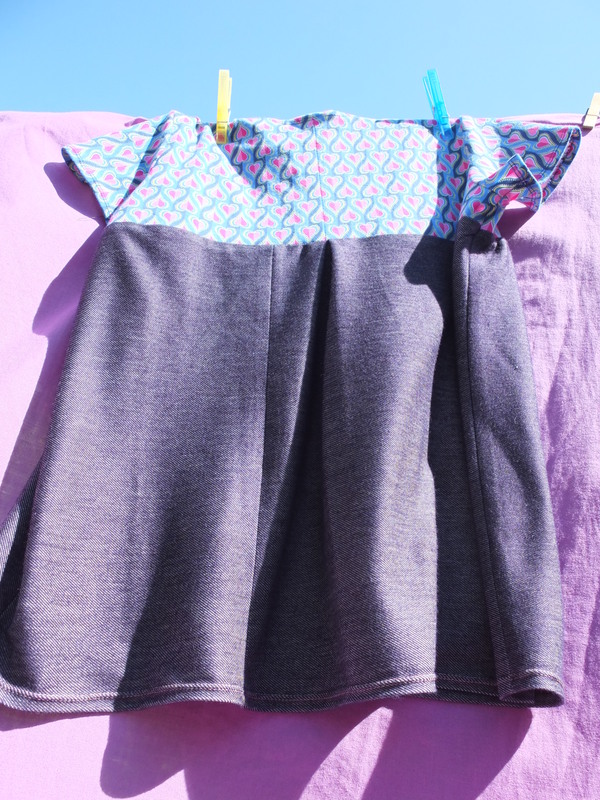 I hacked my good old trusty Simplicity 1573 pajama pattern, making the yoke finish just below the armholes, just to make life easier so I didn’t have to worry about attaching my sleeves over the fabric change. 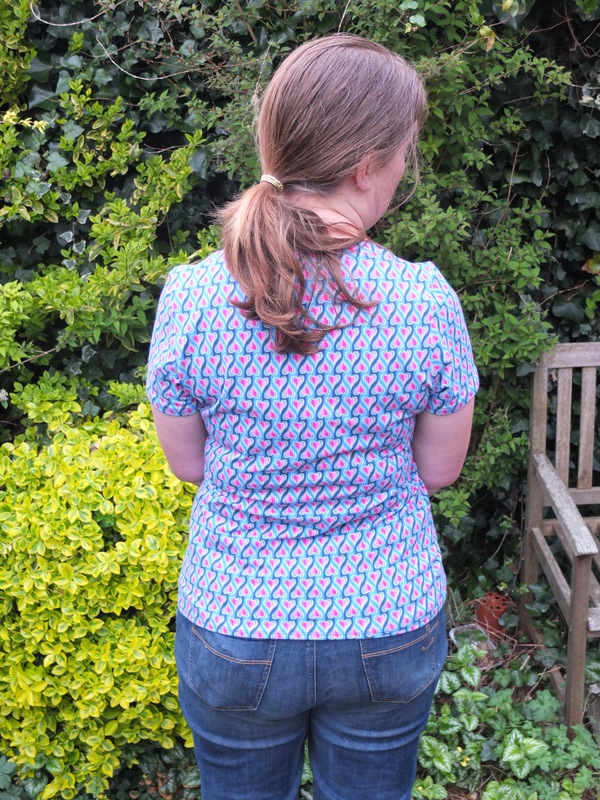 Also there was no more length of the navy than what I used so I couldn’t really have gone much smaller on the yoke as I wanted a slightly long top that would last a year or two (the top, being big 4, is plenty wide enough in the size 7 (her age), without being overwhelming). I think a smaller yoke looks better, in the unlikely event I ever make this again. The navy fabric is 1 1/2 times the width of the yoke, gathered, hemmed, seam allowance pressed down. The pockets just about used the last of my heart scraps up, I like that they balance it out. (They were also slated as being too small to fit her entire hand in at once.) Do you like the contrast pink topstitching at the bottom because I ran out of navy? The back yoke had to be cut in two pieces but I got it matched ok (I wasn’t trying for perfection on this one, just getting all the pieces out of my scraps was hard enough). I had to piece the navy too, but I couldn’t make the seam go down the middle. 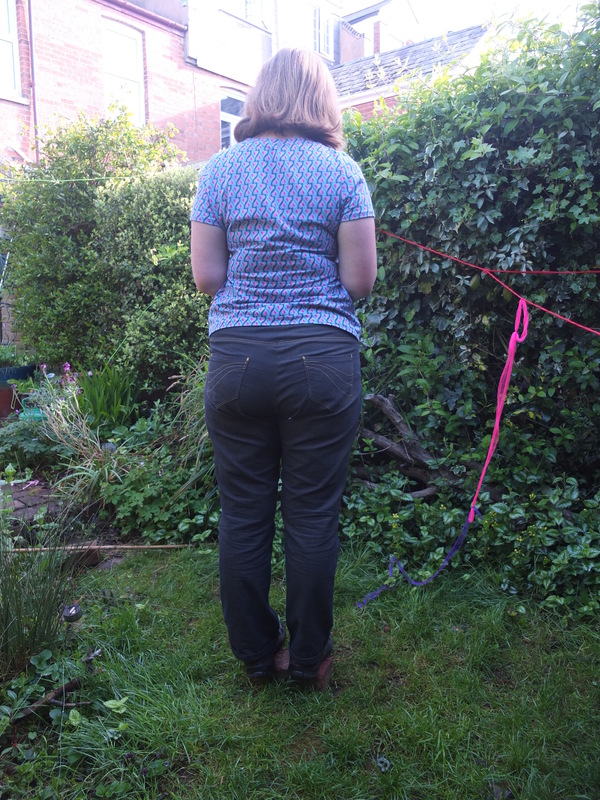 I considered cutting it again and having two symmetrical seams but I really couldn’t be bothered. Then, after all that, it was a little wide, so I put a pleat in the centre (I couldn’t even be bothered with gathers at this point). 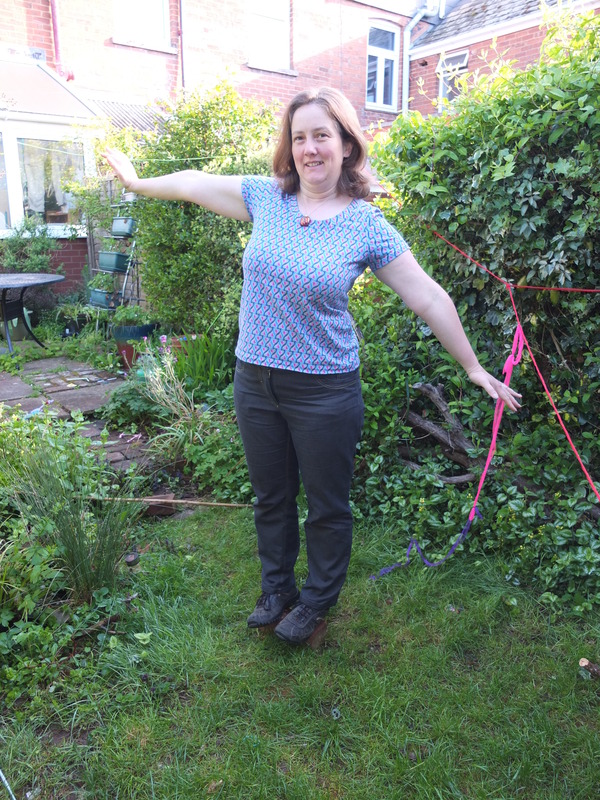 neckline elastic, which is very hard to see as it’s clear, it’s hiding under the zig zags, honest! I didn’t really have enough left of anything for a band, so rather than just fold the edge over and stitch it down, I tried the technique from the back of the Day to Night top. 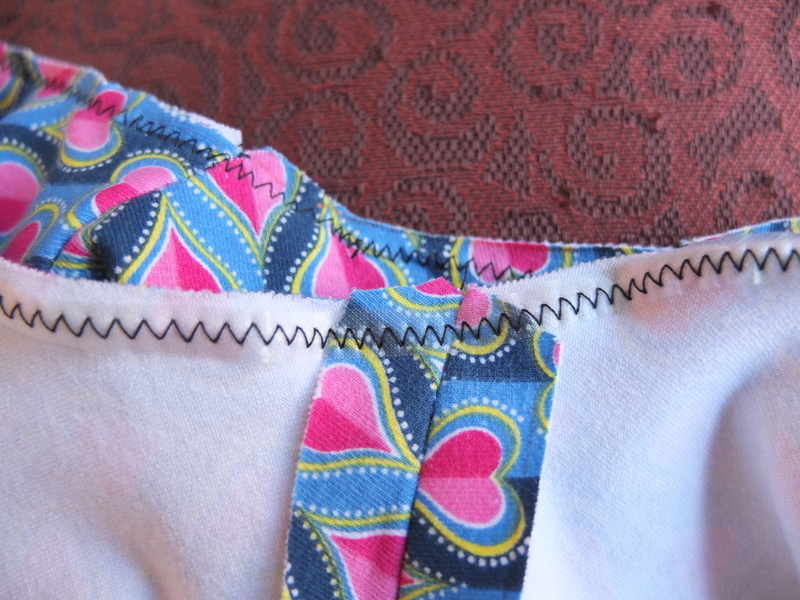 I sewed clear elastic (which I prestretched then let relax as per the instructions) in the seam allowance with a zig zag. Then I turned it over and topstitched it down with a twin needle. I’d like to see how that wears, but I’m not going to find out am I! 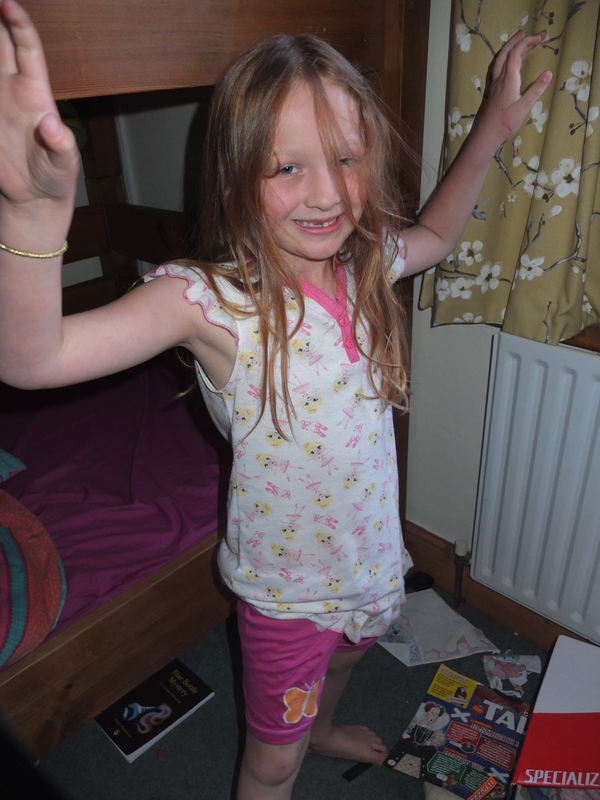 The t shirt has been left at a friends house to see if her daughter will wear it (she’s the same size as my girl). I wasn’t upset that my daughter didn’t like it (after all, she hadn’t been requested it or been involved in the design process) but she was quite rude to me about it which just made me want shot of it rather than keep it hanging around in case she changes her mind. So, next time, I reckon I’m due a garment that fits and is appreciated by the person I make it for, right? Do you ever find that getting things done helps get more things done? After the success of Fridays new t shirt I felt bouyed up and ready to tackle the Full Bust Adjustment on the Maria Denmark drape top pattern. 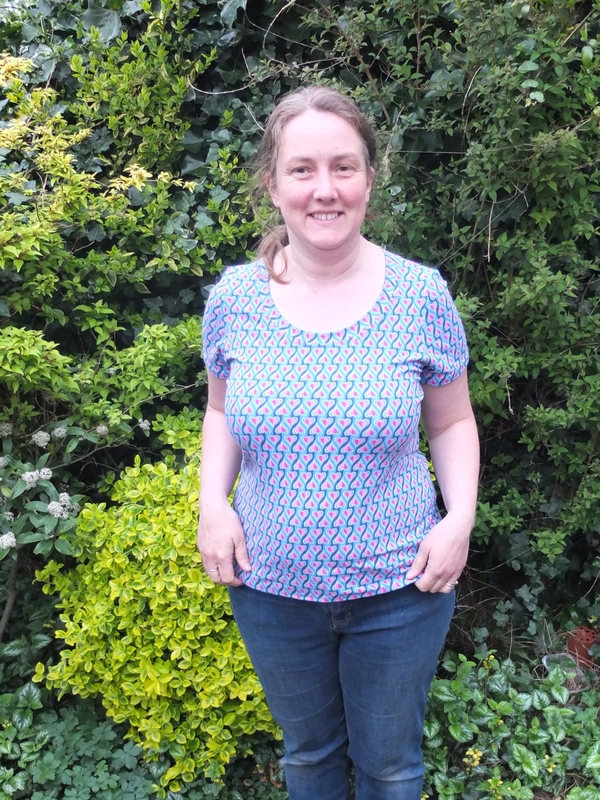 And it wasn’t as bad as I feared, as the pattern is just a normal t shirt pattern from the armholes down, so I measured and worked out and did a FBA and then took out the dart and I was feeling pretty pleased. I even got the pattern pieces cut before bed and was looking forward to sewing them up the next day and having a new top to wear and then cutting another one and sewing that up too. So, next days sewing started out well. I have some clear elastic now so I was able to follow Maria’s instructions this time and very good they were too. Before long I had a top with a cowl next thingy and sleeves and side seams all ready to try on…. And it was too tight again! With the drag lines between my “bust apexes” (or should that be apeces?). Not quite sure what went wrong. 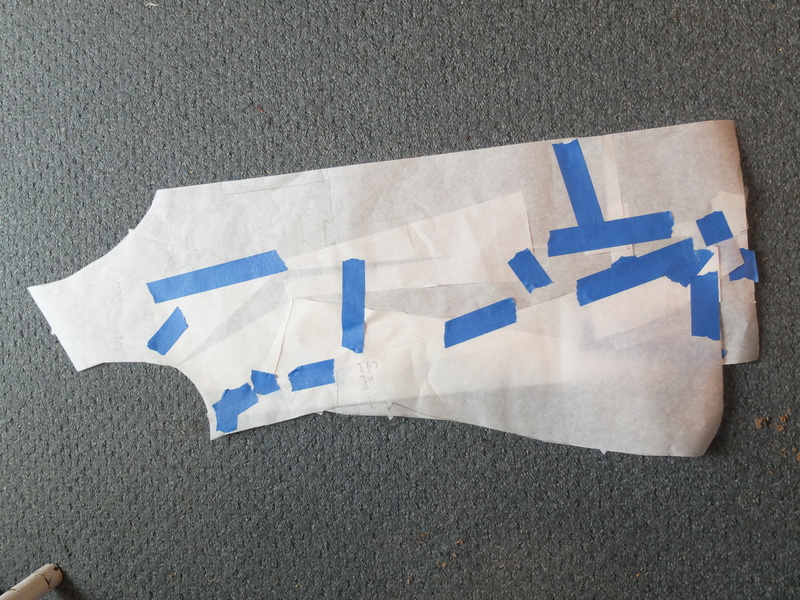 I definitely added 3cm to the pattern piece, which is 6cm to the top front as it’s cut on the fold. I compared the pattern piece to the last one and it’s not much different. Needless to say, it’s going off to the same friend as the last one. Once I’ve stopped sulking at it and hemmed it and finished the neckline. Which may take a few days. I have a couple of other things to do for her too. A ridiculously long maxi dress she gave me to alter at the end of last summer than needs taking up. And the Tova top I made that has been sitting on my pile for about a year waiting for me to “do something with it” to make it wearable. My mum thought it needed taking up as it was too tight in my hips. I thought it was too baggy in the small of my back and too tight in my bust. But after a year I’ve decided that really, I can’t be bothered, so it’s going to my friend too. Once I’ve finished the side seams. I know I’m not the only one. 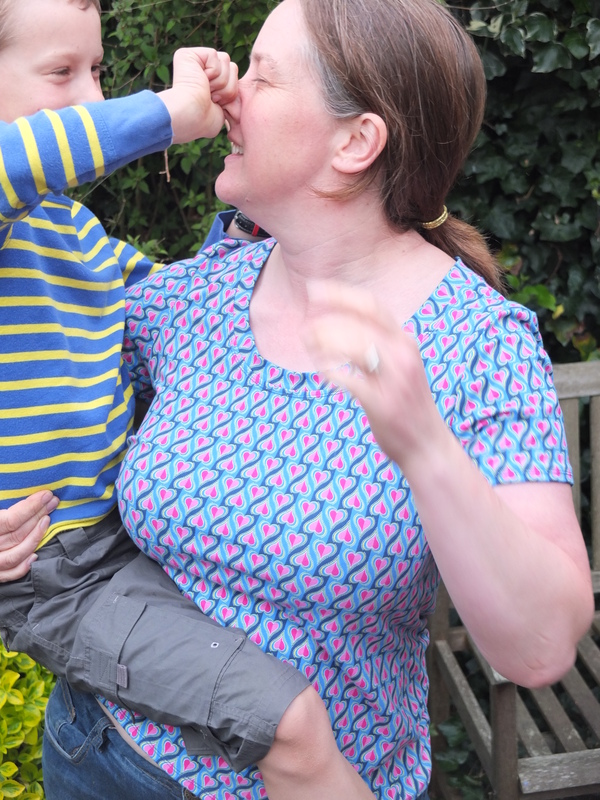 I loved seeing Sew South London beaming in her new dress that Thimberlina had made. And if Thimberlina is anything like me she’ll be pleased as punch that someone is appreciating her hard work and it was completely a wasted effort. While I was at it I also gave the huge amount of left over fabric from my Tova to a friend who’s daughter is going through a monochrome phase. I had thought about making a different kind of top for me with it, but I hadn’t got around to that either. Anyway, back to the drape top. What do I do now? Give up on it all together? Or try one last time. I wondered if the drape top is supposed to be clingier than the Birgitte, so maybe I could trace the bottom of the armhole down of the Birgitte and then try and match that up to one of the larger pattern sizes of the Day to Night Top. I think that might work. But if it goes wrong then it’s going to be a bit embarassing to give my friend 3 iterations of the same failed top. This week has been slow sewing wise. Actually, that’s not entirely true, the other day I had a mending blitz and replaced a broken strap clip on hubby’s favourite bag as well as replacing some stitching on a leather patch on the bag before it came off taking the other end of the strap with it. Then I fixed a coat the Boy has just grown out of so I can pass it on, fixed one of my dresses, one of the Boy’s pajama top and finally got around to adjusting the elastic in the Girl’s Christmas skirt. Phew. But new things making wise, it has been slow. Partly this has been due to non sewing things, but I realised yesterday it was also that I was also a little bit put off by my plan for this week. I have 2 pieces of material I’d like to try the Day To Night top again. But after last time, I need to try and fiddle with the pattern a bit (although I suspect my friend wouldn’t mind so much if I gave her another iteration or two of that top as she really likes it). And the thought of working out how to do a FBA on a drape top seemed hard. So I kept waiting for the right time to start. Which never seemed to come. So, today I switched it up and did a project from further down my to do list. A remake of my favourite Birgitte T shirt, in some scrumptious new fabric I got when in a recent splurge on the Kitschy Koo website. There’s not that much to say about the make, I used the same full bust adjustment (FBA) on the front as last time (which adds 3cm to the pattern piece so 6cm to the fabric as it’s cut on the fold), but I used the unadjusted sleeve this time. Can you tell I’m pleased with it? Although those creases pointing at my armpit make me think there is a little room for improvement (maybe it needs even more adding in the bust?). Although I was wearing the 70’s Birgitte cut from the same pattern pieces yesterday and I’m pretty sure that one doesn’t have those creases. I think doing FBA’s makes my back’s fit a little better, as the t shirt back is only a large (it would need to be XL or 2XL if I wasn’t doing a FBA), but there’s still folds of fabric in the small of my back. 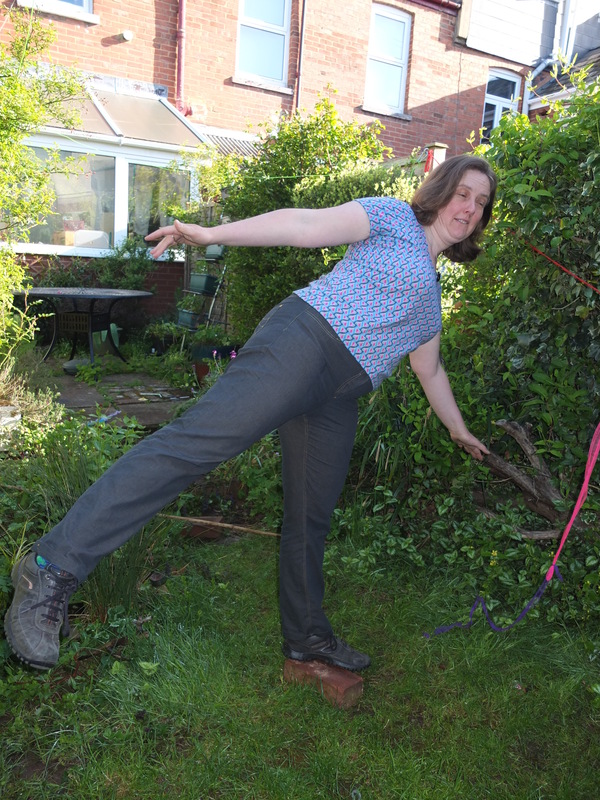 I think the next step is to investigate what sway back adjustments entail, unless anyone has a better suggestion? For some reason the fabric seems a little out of focus in all my photo’. It’s this print which I bought from Kitschy Coo (and the above photo is from there too). The fabric is lovely quality, all the fabric I’ve ever had from there is lovely quality and it wears well, so I don’t mind the price so much as the much cheaper t shirt fabric I got last year is pilling like crazy (unlike the heavily worn t shirts I made the kids from fabric from this source). And did I mention the service is great too? Amanda is even patient and understanding with daft customers who hassle them about missing orders which turn out to be due to the customer giving her the wrong address. The other place where there is a small room for improvement is the neck band, which doesn’t quite lie flat. Probably due to a combination of it being quite wide and being in self fabric not rib. I didn’t have any appropriate rib and wanted it to have a whole depth of a heart on, which I managed and looks nice, so I can live with the slight wobble. Overall I give this make 9/10, it was quick to make, nothing went wrong, the fabric is lovely and wearing it makes me smile. I’ve even made a start on adjusting the pattern pieces for the Day to Night top.